The last 25 years have witnessed an explosion of research at the intersection of typical language development and child language disorders. A pioneer in bringing these fields of study together is Robin S. Chapman, Emerita, University of Wisconsin. This contributed volume honors her with chapters written by former students and colleagues, who track in their own research the theme of psycholinguistic contributions to our understanding of the nature and remediation of child language disorders. 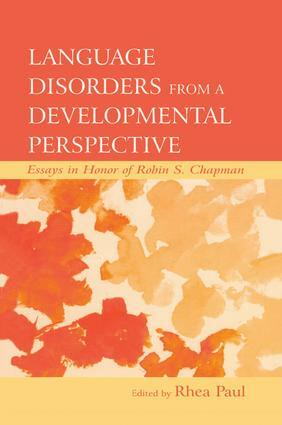 In this volume, such renowned researchers in child language development as Dorothy Bishop, Judith Johnston, and Ray Kent, among others, discuss their research in certain populations in the context of the significance of, limits of, and alternatives to Robin Chapman’s developmental interactionist perspective. Studies of disordered language in Down’s Syndrome and Specific Language Impairment, in particular, attribute much progress in our understanding of the pragmatic and comprehension skills in these populations to the developmental perspective. Language Disorders From a Developmental Perspective opens with a reprint of Robin Chapman’s seminal 2001 article from The Journal of Child Psychiatry and Psychology. It concludes with a new chapter from Dr. Chapman summarizing what we know and what we don’t know about language disorders within the developmental framework, and pointing to future areas of research and intervention. Clinicians as well as scholars will benefit from this book, as will students in programs of developmental psycholinguistics, child language disorders, and learning disabilities. Contents: Preface. R.S. Chapman, Children's Language Learning: An Interactionist Pespective. R.D. Kent, H.K. Vorperian, In the Mouths of Babes: Anatomic, Motor, and Sensory Foundations of Speech Development in Children. S.E. Weismer, Typical Talkers, Late Talkers, and Children With Specific Language Impairment: A Language Endowment Spectrum? T. Klee, W.J. Gavin, S.F. Stokes, Utterance Length and Lexical Diversity in American- and British-English Speaking Children: What Is the Evidence for a Clinical Marker of SLI? E. Crais, Gesture Development From an Interactionist Perspective. R. Paul, K. Chawarska, A. Klin, F. Volkmar, Dissociations in the Development of Early Communication in Austism Spectrum Disorders. L. Abbeduto, A. McDuffie, Language Learning and Use as Embedded Social Activities: Evidence From Autism and Fragile X Syndrome. M.C. Johnson-Glenberg, Fragile X Syndrome: Memory Skills and the Emergence of Reading in Males. E. Kay-Raining Bird, The Case for Bilingualism in Children With Down Syndrome. H.L. Johnson, The Development of Communicative Competence in Vulnerable Populations. C. Dollaghan, Can Verbs Be Hubs? J. Miller, Documenting Progress in Language Production: The Evolution of a Computerized Language Analysis System. D.M. Bordreau, Narrative Abilities in Children With Language Impairments. S.N. Calculator, Developmental Considerations in Addressing the AAC Needs of Children With Severe Disabilities. L.M. Milosky, E. Skarakis-Doyle, What Else About Comprehension? Examining Young Children's Discourse Comprehension Abilities. R.S. Chapman, The Developmental, Interactionist Perspective: An Afterword.